All our sites are designed to work just as well on mobile as they do on desktop. As standard all our sites also come with a free security certificate. Our solutions are designed with small businesses in mind. We're really pleased to see you and we'd love the opportunity of hearing about your project and providing you with an honest appraisal of how we can work together to help your online business thrive. At times we have occupied other slots in the results also and we work hard in social media to ensure our brand is there whenever someone looks for web hosting, design or SEO services in Tenerife and the Canary Islands. Our clients range from independently owned cafes and restaurants through to hairdressers, local charities and even hotel groups and in all cases we work with our clients to ensure that they get measurable results that increase their turnover and profits. In the 10+ years we have been designing websites for businesses in Tenerife we have covered project from Scuba diving through to restaurants & entertainers, hotels and much more. Within 3 months of setting up our website we reached number 1 in Google search and we have remained in that position since. Put simply: This is what we do for our clients. It requires a lot of work on both parts and for that reason we work closely with our clients to ensure they know what to do to best help their online presence. For that reason we don't simply "design websites". We also focus on social media and organic SEO as these methods help drive traffic to your website and ultimately your business. We've been designing websites for over 2 decades now and the last 10+ years of that we've been designing websites not only for clients in the UK & the US but also here in Tenerife. Each project at Website Design Tenerife receives individual attention and we make sure you're informed every step of the way so you are in control of the final product. We work with companies in the US from as far west as California to New York on the East coast. We also have a number of UK based clients and of-course we have a number of clients here in Tenerife. Our experience spans over 2 decades and 3 countries so you can imagine we're used to taking on larger projects while also looking after local businesses such as cafes, bars, restaurants and even hotel groups. 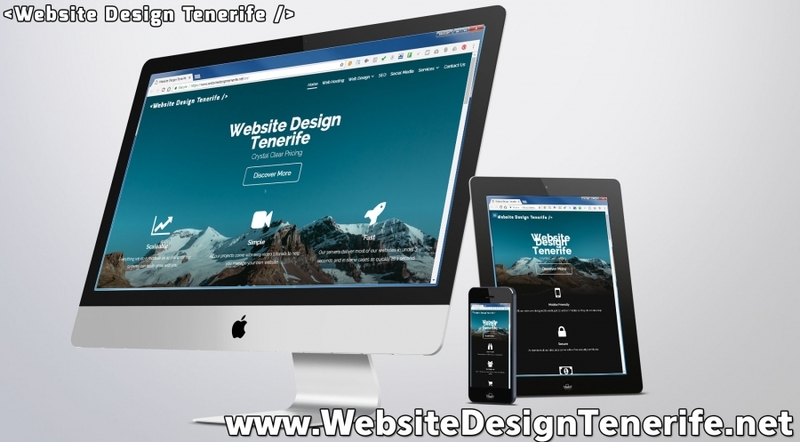 With Website Design Tenerife you benefit from this experience because while your project may not be more than a few pages and perhaps some social media marketing the tools we have at our disposal help your business where it matters most: in the search results. One thing we are keen to do with all our clients is provide them with the means of making more profit with less effort. We find areas of your online business that can be automated and streamlined and use this to help you and your business grow. To help new and smaller businesses get started we also offer an introductory package at just 99 Euros ! Restaurant Websites From Just 1€ ! Make between 500 and 1,000 Euros more per month easily with our restaurant web design packages ! These deliver sites 10x quicker than a regular hard drive and many sites are being delivered in less than 3 seconds ! Free 30 days money back guarantee on all plans.